rainbow-edged and irresistible to unicorn lovers . . . In Greek mythology, the horn of the goat Amaltheia who fed the infant god Zeus became the fabled Horn of Plenty – or Cornucopia. It becomes full with enormous quantities of whatever the owner wants. The clever yet fun title of this book gives you a fine sense of the light-hearted learning you get inside. 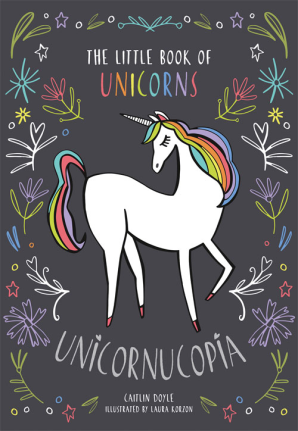 With over 200 pages, and eight different sections, there’s plenty here to feed a unicorn addiction. The cover and illustrations, together with the informal mix-and-match of fonts, go perfectly with the text. The colours are pastel, but not vapid, the images are sunny and the print is friendly and cheerful. You can see at a glance that you’ll get entertaining feel-good facts and fancies. There are heaps of Did You Know? features throughout. Some will probably surprise the most ardent of unicornophiles! It’s a hard book to classify: there are factual sections on History, Science, Culture, Food and Crafts, but also Spells, Charms, Myth and Magic. A ‘compact compendium’ defines it best. You’d consult it more for inspiration and amusement than erudition. 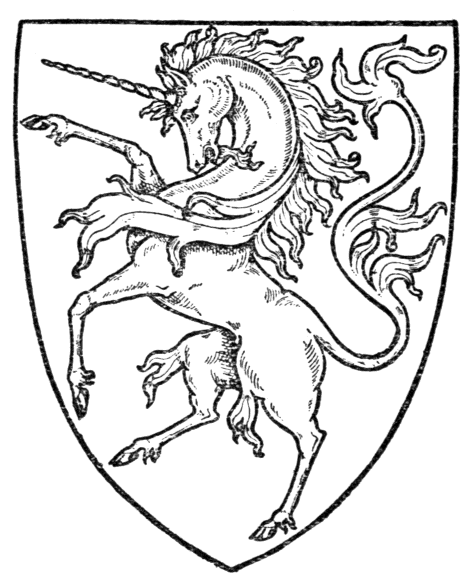 You certainly won’t find the ferocious heraldic beast with cloven hooves, a goat’s beard and a lion’s tail between its covers. But as a starting point for imagination, it’s an absolute charmer. The subtle slate-grey cover makes this book welcoming to readers of any gender. The rainbow-edging is immediately appealing and inclusive. This kind of book suits a wide readership – it’s more to do with shared interests than age. Such a variety of approaches give something for everyone to enjoy: you can learn, cook, create, get inspired and find out more from the bibliography. It could be a starting point for themed workshops in schools, clubs, or festivals. This kind of compendium would make an excellent companion piece to a novel or series featuring any animal – mythical or otherwise. It would be a great place to put all the really interesting research bits you couldn’t squeeze into fiction! This entry was posted in Review and tagged #writersreviews by KMLockwood. Bookmark the permalink.